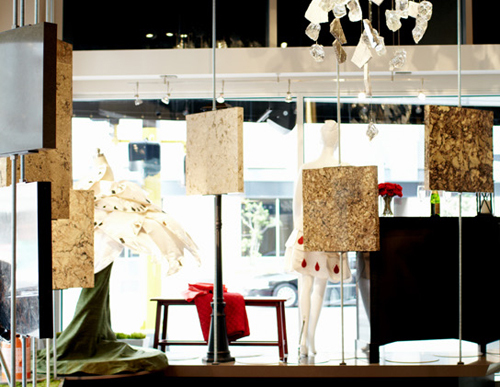 The Cambria Gallery on 7th in Downtown Minneapolis is a premier showroom-studio designed to exhibit Cambria’s beautiful natural quartz and broadcast live WCCO performances. 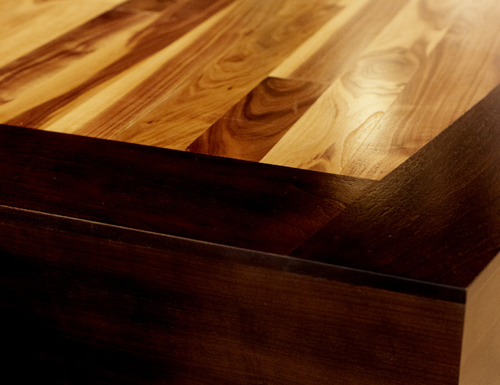 Cambria is naturally a very durable, low maintenance and indoor air quality certified product. 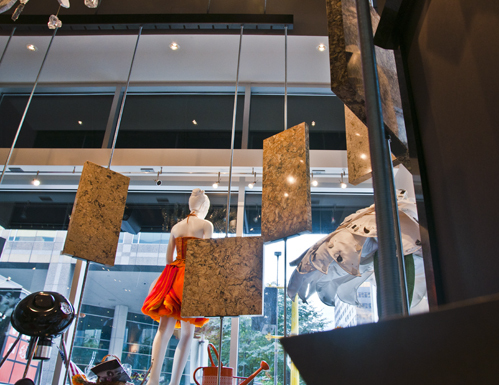 As a result, incorporating sustainable materials throughout the space was a point of emphasis. To accomplish this, Bishop utilized local suppliers for the hardwoods, metal and glass. The wood, including this walnut performance stage, was Forest Stewardship Council Certified lumber. FSC lumber is harvested from sustainably-managed forests, while the conference room barn wood, was recovered from old barns dismantled in and around Balsam Lake, WI where Bishop is located. The wood finishes used were low VOC to maintain indoor air quality. Cambria wanted to create a space where architects and interior designers could meet with clients, share ideas and find design inspiration. 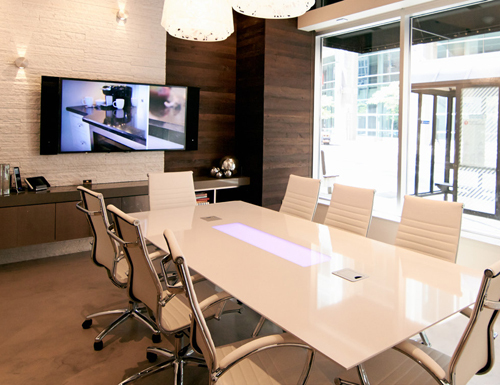 The conference room entails many custom fixtures designed and built using unique materials. 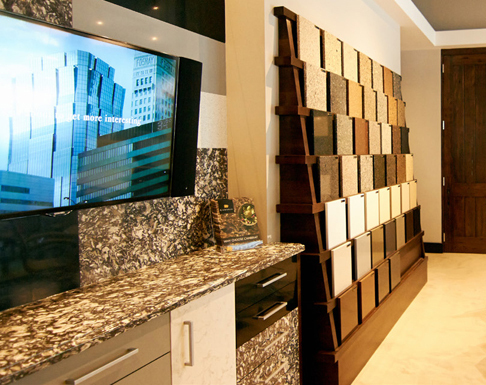 Cambria wanted a space where they could display full-sized slabs of their product. Each A-frame had to safely hold 2 slabs of Cambria, each weighing over 700 pounds. 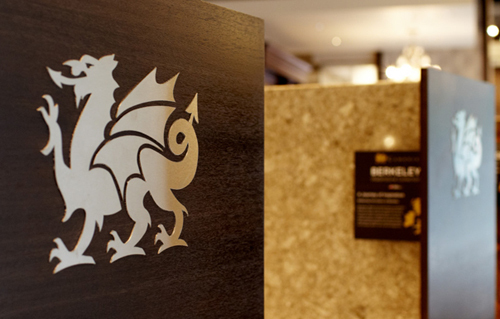 Bishop Fixture + Millwork worked closely with Cambria and their architect to translate their concepts into detailed shop drawings. We then built a functional prototype to review and refined it. The A-Frames highlight the Cambria slabs’ features, they make it easy for showroom managers to swap designs and they are highly mobile fixtures that are consistent with Cambria’s brand image. 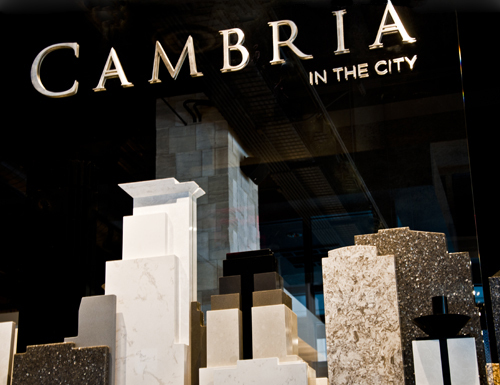 There are over 100 Cambria designs on display at the Cambria Gallery. We utilized our vast merchandising experience to help build solutions that showcased Cambria in a wide variety of applications. 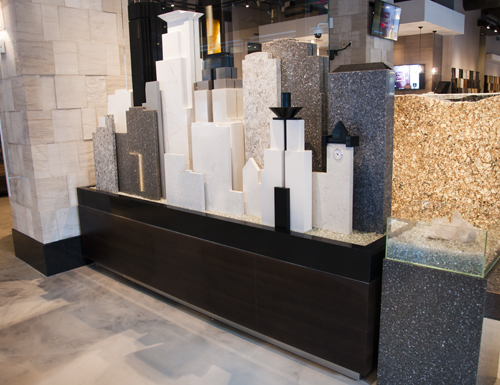 Custom slab displays showoff the Cambria Quartz to Minneapolis year-round.